Wednesday December 15th, 1982: no message, Myrna runs away, frightened. Saturday December 18th, 1982: first message published in literary Arabic. Saturday January 8th, 1983: one word pronounced in dialectal Arabic. Monday February 21st, 1983: second message, private message pronounced in dialectal Arabic. Thursday March 24th, 1983: third message - message pronounced in literary Arabic. These messages are in full harmony with the Gospel through their deep spiritual meaning and their pressing appeal to faith, love, announcing the Immanuel, repentance, humility, joy in the Lord, mutual forgiveness and Unity of the Church and especially the unity of the feast of Easter. All apparitions have taken place at night, on the terrace. Only Myrna saw the Holy Virgin. An intense atmosphere of prayer and peace around her and throughout the house prevails during the apparitions. 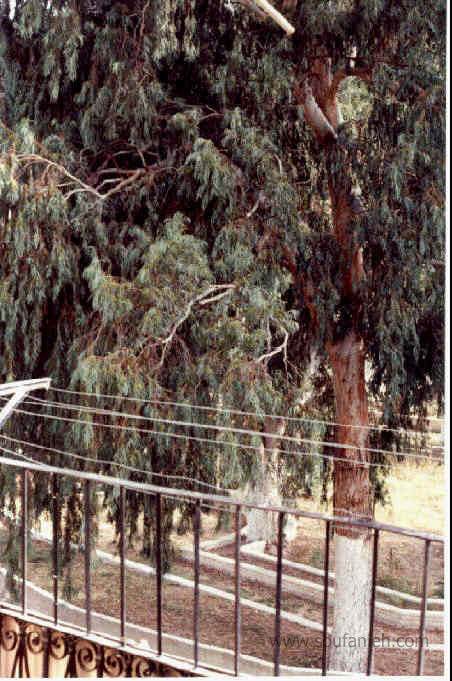 The apparition manifests itself on the horizontal branch of an eucalyptus tree situated at the edge of the river about fifteen yards (meters) to the south of the house. A globe of light appears first, then opens, enabling the sight of a blue crescent high above that disappears once the Holy Virgin appears. The Holy Virgin is first sitting on the branch, then She stands up and walks towards the terrace of the house, leaving behind Her a wake of light. She crosses the iron railing and stops on the terrace. The passage of the Holy Virgin through the iron railing has raised a problem to Myrna: "How can a human body cross an iron railing ?" She is dressed in white, with a blue belt, covered with a sort of hood forming part of the dress and wearing on her right shoulder, a blue shawl (similar to the painting of the Assumption by Murillo). She holds in Her right hand between the index and the annular a rosary of crystal color. The right arm is folded at the height of the chest, the left arm down by Her side. Her feet are invisible. The Holy Virgin delivers Her message to Myrna and what She says is inaudible to the persons present. Myrna repeats slowly the message just heard. At the end of the vision, the Holy Virgin returns to the eucalyptus, moving backwards. Once on the branch, She disappears first, then the globe.